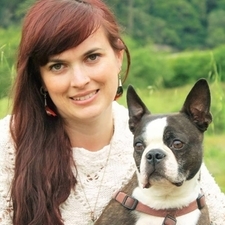 Our Team - SUNNY BRAE ANIMAL CLINIC INC.
Dr. Hight is originally from Smith River, California. He graduated from Humboldt State University in 1972 and Kansas State University school of Veterinary Medicine in 1978. 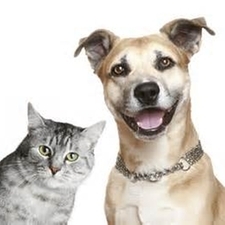 He moved back to California with his wife Diana and started working at Sunny Brae Animal Clinic in 1978. He became co-owner of SBAC in 1979, and sole owner in 2013. 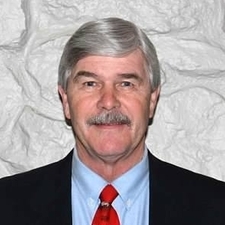 When Dr. Hight is not working, he enjoys golfing, fishing, camping and spending time with his children and grandchildren. Dr. Hight has two labradors named "Lily" and "Ashton", and a cat named "Blue" as well as his old quater horse, "Rocco". Dr. Tami Reynolds is a native of the Bay Area. She initially set out to pursue a career in anthropology, but after working for a cat rescue group in rural Colorado, decided to change her direction and become a veterinarian. She completed a degree in Molecular Biology from Adams State College and her veterinary degree from Colorado State University. She has been at Sunny Brae Animal Clinic since June of 2008. When she is not at the clinic she enjoys the many outdoor adventures available in Humboldt county, especially taking her two dogs "Moki" and "Lomi") to the beach! She also has two cats named "Junior", and "Yeti". Dr. Susan Burden has been a member of the Sunny Brae team since 2001. She grew up in Mount Gilead, Ohio and received undergraduate degrees in Pre-Veterinary medicine and Biology from the University of Findlay. She obtained her DVM at the Ohio State University in 1998. In Humboldt County, Dr. Burden enjoys hiking with her dogs, trips to the beach, kayaking and gardening. Dr. Rachel Carlton grew up in Champaign, Illinois and received her undergraduate degree in Marine Biology from Humboldt State University. After volunteering at the humane society in her hometown, she decided to change her focus to veterinary medicine. 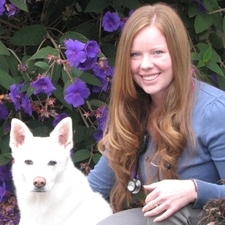 She attended St. George's University School of Veterinary Medicine for the first three years, and finished her veterinary degree at Oregon State University. Dr. Carlton was excited for the opportunity to return to Humboldt County and has been with Sunny Brae Animal Clinic since July of 2013. 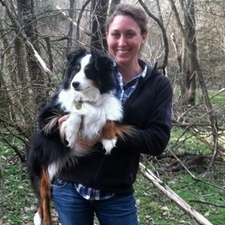 In her free time she enjoys scuba diving, running, hiking, traveling and exploring the outdoors with her dog Grizzley. Born and raised in Metro Detroit Dr. Higgins completed her undergraduate work in Animal Science at Michigan State University. She attended veterinary school at Saint Georges University and clinical training at University of Missouri. She enjoys hiking, cooking, and spending time with her Smooth Fox Terrier Lyla, and holland lop rabbit Brewski-Bunny. Dr. Alicia Garlick grew up in the Santa Cruz Mountains. 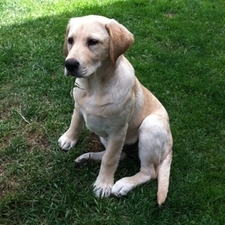 She attended UC Davis for both her undergraduate Biology degree and Veterinary School. 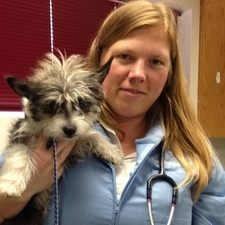 She completed her veterinary degree in 2003, then returned to the South Bay Area to work in Sunnyvale. She moved to Humboldt County in 2014 to be closer to family and enjoy our beautiful outdoors with her husband and children. In her free time, she enjoys horseback riding, especially on Clam Beach! She has a retired Thoroughbred named Jackson, a terrier cross named Chex, two cats, Gremlin and Tira, and an iguana named Izaak. Originally from the San Francisco Bay Area Dr Williams attended Humboldt State University for undergrad, receiving a BS in Zoology. 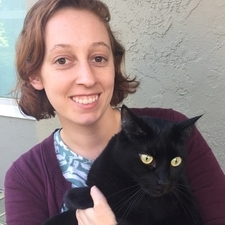 Dr Williams then attended UC Davis for her veterinary education with the intent of moving back to Arcata after graduation to work as a general practitioner, with a particular interest in working with cats and their people. She is excited to be back in the area, starting her career and re-acquainting herself with everything Humboldt has to offer. In her spare time, she enjoys hiking, tide pooling, gardening, and being outside in general (especially at the beach). Dr Williams shares her home with her fiance, Louis, and their foster failure kitty, Mo, rescue pup from Hoopa, BooBoo, lineolated parakeet, Stella, and betta fish, Mick Fanning aka White Lightning. Dr. Amanda Dossett was born in San Francisco and grew up in Pacifica, a small beach town just south of San Francisco. She received her Bachelor's of Science in Evolution, Ecology and Conservation at Sonoma State University. Her undergraduate senior thesis project involved working with endangered western pond turtles using radio telemetry to observe nesting behavior. After receiving her DVM from Western University of Health Sciences, she was excited to move back to Northern California. 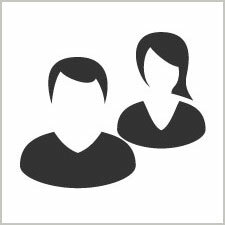 Dr. Dossett's professional interests include general practice and emergency medicine. In her spare time, she enjoys outdoor activities such as camping, biking and canoeing with her fiancé and boston terrier. Dr Carlos Sullivan was born in Los Angeles County and grew up in Zacatecas Mexico where he graduated from Veterninary Medicine in 2009. He then relocated to Humboldt County with his wife and his three cats named "Jack' "Chi Chi" and "Ninja". 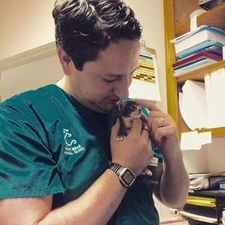 Dr. Sullivan worked as a Veterinary Technician joining the SBAC team in 2014 while obtaining his Veterinary License in the state of California. Dr. Sullivan's professional interests are in emergency medicine and surgery while his personal interests are riding his motorcycle and cooking dinner for his family.